The snow flies! 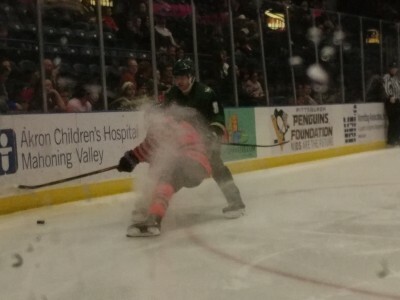 - An unnamed Phantom fights for the puck against the Sioux City Musketeers. The Phantoms opened the New Year with a wild tilt that had them explode in the second period with 5 goals to down the Sioux City Musketeers. Okay, the Musketeers were missing their top two scorers, Martin Pospisil and Bobby Brink, but the Phantoms dominate performance was still impressive none the less. The first period started slow with a good amount of chippiness (is that even a word? EDIT: Yes) between a pair of teams who haven't played each other since February of last year. The Musketeers would draw first blood. With Joseph Abate in the box already for a hooking call, a bad line change with a pair of Phantoms going off and a trio coming on lead to a too many men on the ice penalty and a 5-on-3 powerplay late in the period, at 19:36. The Musketeers quickly capitalized. Parker Ford won the faceoff back to Marcus Kallionkieli who skated around between the high slot and the blueline through a slew of players and a Jordan Steinmetz screen to take a 1-0 lead just 5 seconds after the faceoff. Shots were 8-7 Phantoms after the first. Stoever makes the save! 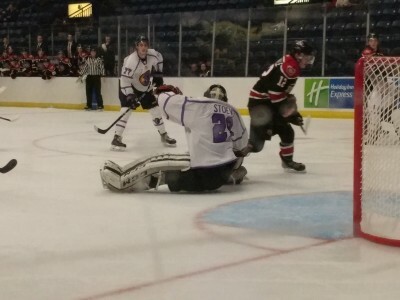 - Christian Stoever is way outside of his crease making a save in Sunday's 4-3 loss to the Chicago Steel. Well, it looked like we started better, but the result was the same. Yesterday's Phantoms game was a better effort than Saturdays to start out, but we sputtered out and came up short to the Chicago Steel for the second game in a row. This dropped us to a game below .500 and 6th place in the Eastern Conference going into the holiday break. We came out with a much better attack than Saturday. Liam Robertson notched his fourth goal of the season on the powerplay, a heavy shot from the bottom of the left faceoff circle off a feed from the goal line by Brett Murray at 6:23 of the first. They extended the lead to a pair of goals off a John Larkin shot from the point that found a seam through the Steel's netminder, Reilly Herbst, at 8:53 for Larkin's first of the season. The Steel got one back with :39 left in the first frame when The Phantoms defense collapsed to one side as Adam Robbins crossed into the Phantoms zone, leaving a wide open path for Mattieu De St. Phalle to sneak in and take a pass for a breakaway on the netminder, Christian Stoever. This was an almost identical play to one of the Steel goals on Friday, where Gunnerwolfe Fontaine set up De St. Phalle for a goal. Shots were 13-9 in favor of the Phantoms after 1. The Phantoms pushed the lead back to a pair of goals on the powerplay early in the second. After a few good chances would not go, Ben Schoen sent a pass from the top of the right faceoff circle to Brett Murray parked on the left side of the goal crease for an easy tic-tac-toe play at 2:50 of the second. This was where the Phantoms seemed to stall out. Teddy Bears! - The Phantoms scored the first goal to initiate the Teddy Bear toss. Unfortunately, Chicago dominated the rest of the game in a 7-2 Phantoms loss. I'm not going to try to sugar coat it, last night's Phantoms performance was just plain bad. Frinday night we were a reslilant team willing to work to overcome a 2 goal deficit twice. Saturday night, we didn't work at all. The 7-2 final score wasn't even indicative of how bad it looked, it could have been much worse. Things started well. 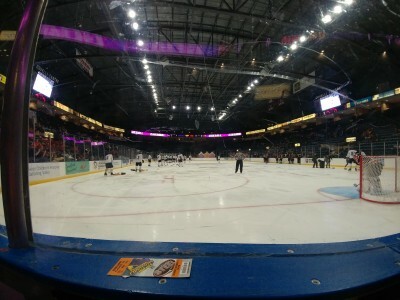 After killing an early penalty, the Phantoms capitalized on a power play of their own. Just like it was probably drawn up, Liam Robertson won the faceoff back to Liam Dennison, who slid a pass along the blueline to Connor MacEachern, who put a slap-pass to the stick of Brett Murray, who tipped it past the Steel netminder, Reilly Herbst. The time of the goal was 5:11. That was it for the Phantoms lead, which was short lived. A little over a minute later, Nick Abruzzese and Neil Shea played a give and go passing in an even numbers situation, with Abruzzese firing a shot from the slot that beat Jon Mor, who was getting on the ice for the first time in almost a month. The Steel would take the lead later, a shot from the left faceoff circle from Gunnerwolfe Fontaine beating Mor at 14:33. Shots were 16-6 in favor of Chicago for the first period. The Steel kept things rolling in the second. Josh Grohl found a blocked shot at the bottom of the right face off circle and quickly tapped a bouncing shot that skipped off Mor's leg and in at 4:45. Next would be Travis Treloar, who took a pass from Nick Abruzzese in the slot, muscled his way around Phantoms defenseman Liam Dennison, and took a shot while falling down at the top of the crease that went over the outstretched leg of Mor at 7:10. Then on the PP, Treloar took a blocked shot bouncing in the high slot and fed Adam Robbins in the left faceoff circle for a one-time goal at 10:40.